What's more fun than a yummy dessert? How about a HEALTHY dessert? Most of these recipes are very quick to make, and some could be served as breakfast. Soak cashews overnight, drain, rinse, drain. Place in blender with banana and enough water to make a pudding consistency. Blend banana and 1/2 Avocado. Put in bowl and adorn with berries. If you haven't tried raw applesauce you are in for a treat! Core apples, if using organic, leave the skin on for good fiber and nutrition. Peel if apple is not organic. Blend, using a small amount of water or apple juice if necessary to enable blender to do its job. A heavy duty blender is required for this recipe. Note: Not for young babies. For an infant, peel and core apple, just use the white fruit. Be sure to blend very well. To get a smooth baby-food consistency, strain after blending well. This recipe calls for a food processor. Soak the nuts in water to cover, overnight or for 8-10 hours. Drain. Rinse. Drain. In a food processor, process the nuts until fairly fine uniform bits. Gradually add the apricots, dates, figs and coconut until well-mixed. Using 1-2 Tablespoons of the date soak water if necessary to create a dough-like consistency. Place in bowl and refrigerate for several hours. 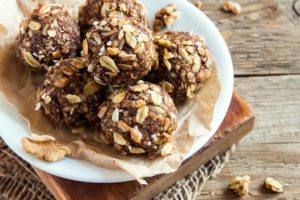 Roll into small balls and press a whole nut into the top of each one. These balls will keep in the refrigerator for up to 2 weeks. Variation: For a rich chocolate type treat, add 1/4 to 1/2 cup of carob or chocolate powder while processing, to taste. Halvah is a candy popular in the Middle-East, where it is usually made from ground sesame seeds. Tahini is a smooth version of ground up sesame seeds, it has a consistency much like peanut butter. optional: 1 Tablespoon plus 1 teaspoon carob or cocoa powder. In a food processor, process the almonds until finely ground. Add remaining ingredients, process thoroughly. On a plate or pan, spread mixture out until it is around 1/2″ thick (don't worry about filling the dish or pan, just press the mixture out until it is the correct thickness). Chill in the refrigerator for 1 hour or more, then cut into bite-size pieces and roll into balls. Variation: For a two toned effect, (more work, longer prep time) before spreading mixture out, divide in half. Add carob/cocoa to one half. Mix well for uniform color. Pat the plain mixture in pan, to 1/4 inch thickness. Then pat the cocoa mixture in your hands until it is approximately the same 1/4″ thickness and shape as the plain one in the pan. Place the cocoa mixture on top of the plain mixture. Press together to form a 1/2″ thick, two-colored slab of halvah. Chill in the refrigerator for 1 hour or more, then cut into bite-size pieces and roll into balls. **honey works best in this recipe both for the authentic halvah flavor and because its stickiness holds it all together. Traditionally, Banana ice cream is made in a juicer that has a blank screen (Champion, Tribest, Samson) this type of juicer has a ‘snout'. However, with the advent of powerful blenders, it's possible to use the blender method. The bananas should be allowed to defrost for a few minutes with the blender method to avoid straining or breaking the blender. Freeze very ripe, peeled bananas. Use 1-2 bananas per serving. When frozen solid, push through the juicer with the Blank screen in place. Awesome just like this, but also super yummy if you add another frozen fruit such as blueberries, strawberries or mango. Alternate banana and other fruit so that each serving bowl has some of each. You may never crave dairy ice cream again! Great with hot fudge sauce on top too. Hint: Always keep frozen peeled bananas and berries in the freezer for desserts and smoothies. Very ripe bananas means way more ripe than most people would eat them. Try these out and let us know which one you like the best in the comments below!